If you are a member of Launchpad’s beta testers team, you’ll now have a slightly different interface for selecting source packages in the Launchpad web interface, and we’d like to know if it goes wrong for you. One of our longer-standing bugs has been #42298 (“package picker lists unpublished (invalid) packages”). 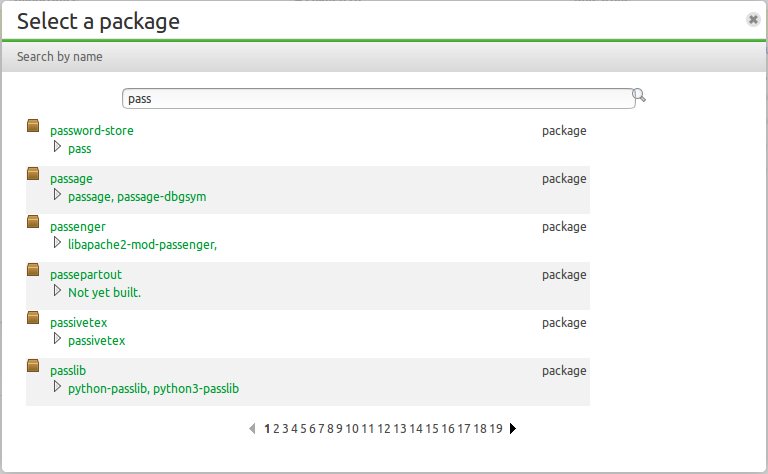 When selecting a package – for example, when filing a bug against Ubuntu, or if you select “Also affects distribution/package” on a bug – and using the “Choose…” link to pop up a picker widget, the resulting package picker has historically offered all possible source package names (or sometimes all possible source and binary package names) that Launchpad knows about, without much regard for whether they make sense in context. For example, packages that were removed in Ubuntu 5.10, or packages that only exists in Debian, would be offered in search results, and to make matters worse search results were often ordered alphabetically by name rather than by relevance. There was some work on this problem back in 2011 or so, but it suffered from performance problems and was never widely enabled. Exact matches on either source or binary package names always come first, and we try to order other matches in a reasonable way as well. The disclosure triangles alongside each package allow you to check for more details before you make a selection. Please report any bugs you find with this new feature. If all goes well, we’ll enable this for all users soon. Update: as of 2016-09-22, this feature is enabled for all Launchpad users. Here’s what the Launchpad team did in October. We’ve been working with our sysadmins for several months to extend ScalingStack to non-x86 architectures, and at the start of Ubuntu’s 16.04 development cycle we were finally able to switch all ppc64el builds over to this system. Rather than four builders, we now have 30, each of which is reset to a clean virtual machine instance between each build. Since that’s more than enough to support Ubuntu’s needs, we’ve now “unrestricted” the architecture so that it can be used for PPAs as well, and PPA owners can enable it at will. To do this, visit the main web page for your PPA (which will look something like “https://launchpad.net/~<person-name>/+archive/ubuntu/<ppa-name>”) and follow the “Change details” link; you’ll see a list of checkboxes under “Processors”, and you can enable or disable any that aren’t greyed out. This also means that you can disable amd64 or i386 builds for your PPA if you want to. We’re working to extend this to all the existing Ubuntu architectures at the moment. arm64 is up and running but we’re still making sure it’s sufficiently robust; armhf will run on arm64 guests, and just needs a kernel patch to set its uname correctly; and powerpc builds will run in different guests on the same POWER8 compute nodes as ppc64el once we have suitable cloud images available. We’ll post further announcements when further architectures are unrestricted. October already! As the leaves start to turn red here in the northern hemisphere, here’s a brief summary of what we did in September. Here’s a summary of what the Launchpad team got up to in August. Here’s a summary of what the Launchpad team got up to in July. Users of some email clients, particularly Gmail, have long had a problem filtering mail from Launchpad effectively. We put lots of useful information into our message headers so that heavy users of Launchpad can automatically filter email into different folders. Unfortunately, Gmail and some other clients do not support filtering mail on arbitrary headers, only on message bodies and on certain pre-defined headers such as Subject. Figuring out what to do about this has been tricky. Space in the Subject line is at a premium – many clients will only show a certain number of characters at the start, and so inserting filtering tags at the start would crowd out other useful information, so we don’t want to do that; and in general we want to avoid burdening one group of users with workarounds for the benefit of another group because that doesn’t scale very well, so we had to approach this with some care. At the moment this only works for emails related to Bazaar branches, Git repositories, merge proposals, and build failures. We intend to extend this to a few other categories soon, particularly bug mail and package upload notifications. If you particularly need this feature to work for some other category of email sent by Launchpad, please file a bug to let us know.